With the Women’s European Football Championship 2017 (Euro 2017) coming to a close today, I decided to entertain myself with some data. What explains which countries brought teams to Women’s Euro 2017 that were able to win their matches? Of course, all credit for winning matches goes to the players and their coaches. Popularity of (women’s) football in a country surely is important for being able to draft good teams. Training facilities, strategies, and all kinds of football-related factors will be of great importance, but those should be analysed by someone who actually knows something about football. Instead, I decided to have a look at three factors that are not (directly) related to football. Gender (in)equality, first, represents women’s opportunities in a country. If inequality is high, fewer women may have the opportunity to play football, let alone to do so professionally. The size of a countries’ population, secondly, will facilitate drafting better players simply because in these countries there are more women who may discover to have talent for football. Finally, I look at how ‘rich’ a country is: richer countries may be able to provide better support to their teams, support (more) professional teams, and perhaps have more youth teams. The story came out a bit technical, but bear with me. To test these ideas, I used data on the results of all matches played in Women’s Euro 2017 (including the qualification matches, but given the time of writing without the final). I used data on each match twice, once to assess the likelihood that team A would win, and once for team B. More sophisticated analyses would simultaneously account for characteristics of both teams in each match, as well as the structure of the tournament, but for now this should do. I then estimated a multilevel (logistic) regression model of the likelihood that each team would win their matches with random intercepts for each country (one might interpret these random effects as the latent capability of each team). Data from the United Nations were obtained on their Gender Inequality Index (from the Human Development Reports), population size, and GDP per capita. The latter two were logged and standardised. Some additional datapoints, for instance on Wales and Scotland, were obtained from wikipedia. Andorra and the Faroe Islands were removed due to missing data. It should be stressed that this is a very simple analysis, done for fun, and results should be interested with a grain of salt and certainly without causality. The results are presented in the Table below. Model 1 is just a baseline model to estimate how much countries differ in their likelihood to win matches (represented by the random intercept variance, to which I’ll return later). Model 2 shows that countries with higher gender INequality have a lower likelihood of winning matches. Model 3 shows that countries win more matches when they have a larger population and a higher GDP per capita. The effect of gender inequality now vanishes (this is due solely to adding GDP to the model, not shown). This is easily explained: in more gender equal societies more people contribute to the formal economy, thus boosting GDP per capita. 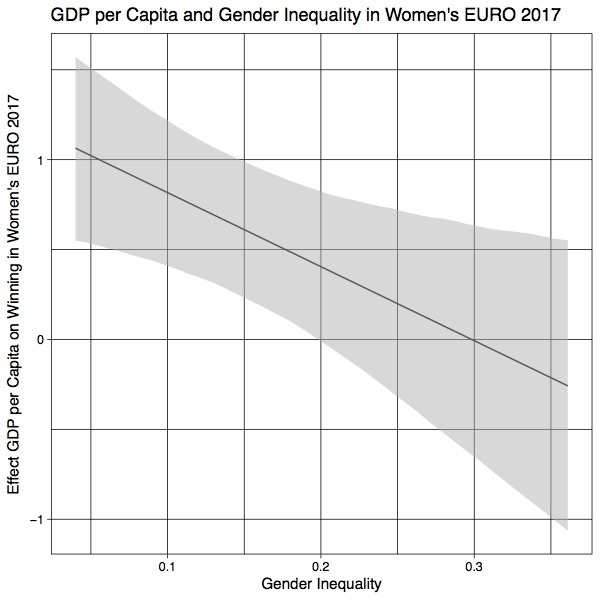 Thus, gender equal countries have performed better on Women’s EURO 2017 in part because their level equality made this countries more prosperous. Finally, Model 4 shows that the effect of a higher GDP per capita are weaker in more gender unequal societies. In other words, the benefits that rich countries have only benefit women’s teams in Euro 2017 if these countries have an adequate level of gender equality. This interaction is shown in the Figure below. Countries that score higher than 0.2 on the gender inequality index (about the level of Latvia and Kazakhstan) have no benefit of an increase in their GDP per capita. The Table also showed the random intercept variance to represent how much countries differed in their capability to win matches. In the baseline model this was estimated to be .99. The absolute number doesn’t mean that much, but when gender inequality is accounted for in model 2, the number is almost halved to .55. This means that levels of gender inequality explain almost half of the differences in countries’ performance in Women’s Euro 2017. Also accounting for population size and GDP per capita (model 3) further reduces the random intercept variance to .13, and the interaction between GDP and gender inequality leaves the variance at .06. This means that with these 3 variables, 94% of differences between countries’ performance can be explained. 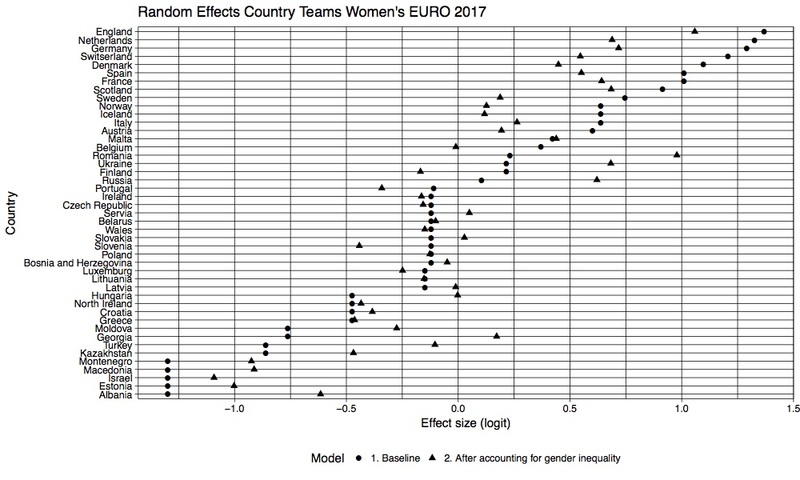 One important take-away from these models is that the likelihood that a national team did well in Women’s Euro 2017 was determined by (/associated with) to a very large extent with structural factors that are not directly related to football. Another is that gender equality plays a major role. Will the models tell us who will win tonight? No, for that purpose more detailed models would be required. The figure below shows the random intercepts (i.e. the latent capability of each country to win matches) as estimated for each country. The circles show the baseline estimates, indicating how well each team did during the tournament (for those interested, the triangles show how countries would have performed had it not been for their level of gender inequality. Generally, countries that did well would have done less well had it not been for their high level of gender equality. Romania and Russia, for instance, would actually have performed better if these countries had better gender equality.). So far, the Netherlands have done slightly better than Denmark (in part, of course, by the Netherlands beating Denmark earlier in the tournament). Yet, England is estimated to have done better than the Netherlands, and Germany better than Denmark (remember that these data also include the qualifying phase of the tournament). Evidently, both England and Germany are out already (eliminated by the Netherlands and Denmark, respectively) which indicates that there are plenty of things these models do not account for. Teams ‘growing’ into the tournament being one, and both the Netherlands and Denmark seem to have done so. What these analyses do suggest, is that Denmark and the Netherlands would not have been final had these not been rich countries with high levels of gender equality. For the rest, who will win tonight is up to the players.